The new home for The Cincinnati Shakespeare Company (CSC) The Otto M. Budig Theater brings Shakespeare into the 21st century. The CSC needed a place where they could connect with state of the art technology, new patrons, and the community. Situated adjacent to Washington Park, School for Creative and Performing Arts, and Over The Rhine the new location offers a branch into Cincinnati’s historic arts district. The exterior features floor to ceiling windows that reveals pre-show and intermission buzz around the lobby. 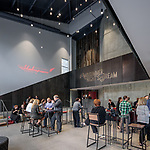 A redesign of the theaters seating layout not only added an additional 100 seats, but also brought each seat within 20 feet of the thrust stage creating an intimate and engaging viewing experience for the patrons. Small details give a homage to Shakespeare from a Romeo and Juliet balcony to thirty-eight steps leading to the second floor one for each of Shakespeare’s plays. The second floor features a rehearsal and event space that overlooks the park and also gives a passerby a sneak peek of swordplay or a soliloquy.